Blog Pets? We love ours, how about you? Pets? We love ours, how about you? Here at McOmie Family Dentistry we don’t just love dentistry we love our pets as well. We once had a hygienist that had a pet spider! These days we have a staff that loves having pets. 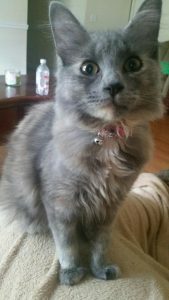 Scarlet’s father is a local Chattanooga Veterinarian, she grew up loving animals. Here are a few of our pets! Lets kick things off with the newest edition to the McOmie Family Dentistry pet family. 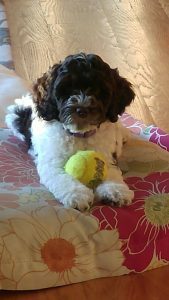 This is Alta it is Dr Mark McOmie and Dr Ellen McOmie’s latest dog. 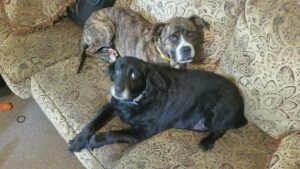 They now have two dogs! Alta is a miniature labradoodle. In this picture taken just this weekend she is only 8 weeks old. The picture to the left is of Dr Mark McOmie and Dr Ellen McOmie’s two dogs. 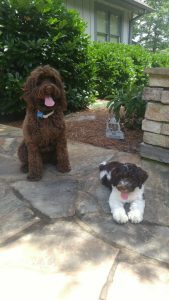 The chocolate dog on the left is a minature labradoodle she is full size and is only 20 pounds. She is two years old. Of course you already got to meet her new sister Alta who is on the right and is 8 weeks old. 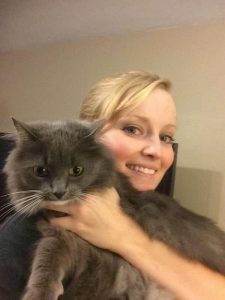 Scarlet is our head hygienists here at McOmie Family Dentistry, when she is not running the hygiene department is is always loving animals. She is a well known animal lover! 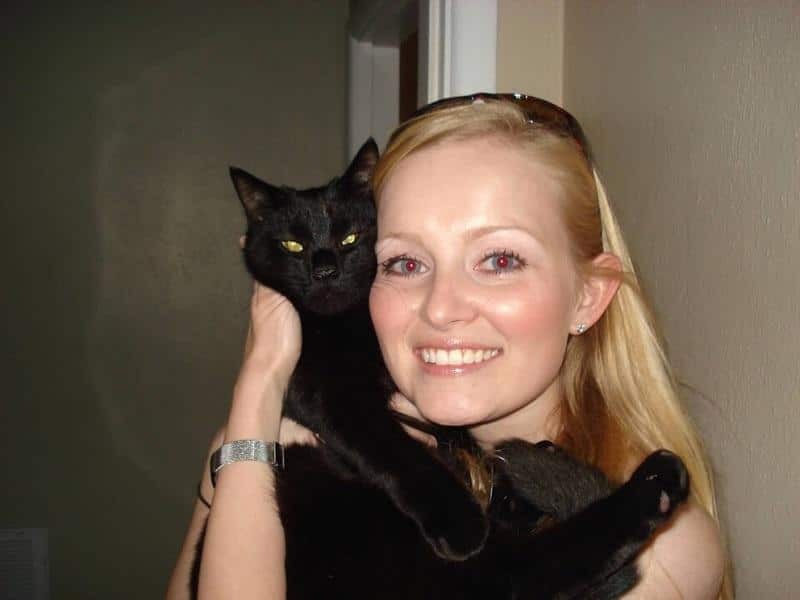 She has many cats we often kid her about being the crazy cat lady of McOmie Family Dentistry. 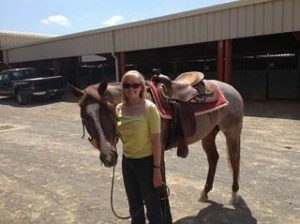 She grew up showing horses competitively. She has probably the most diverse collection of pets of any of our staff. She has had horses, flying squirrels, cats, dogs, hedge hog, sugar gliders all as pets. Here are a few pictures of Scarlet with a few of her pets! One time Scarlet even cleaned this turkeys teeth when it came to our office. 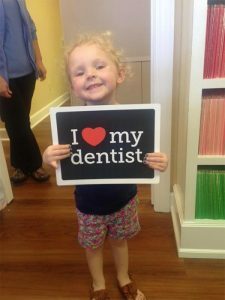 She loves animals and loves clean teeth! Christie is another one of our dental hygienists here at McOmie Family Dentistry. 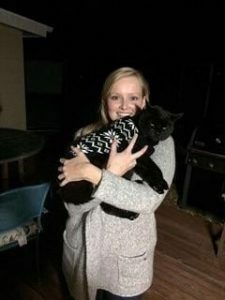 Christie has only one pet, her cat that she loves. 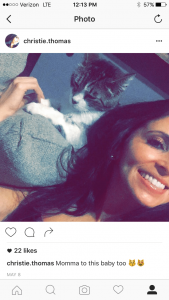 She snapped a selfie with her feline friend the other day. 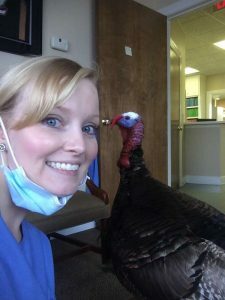 Christie has a kind heart for our patients and her pet. As you can see they both have beautiful smiles. This brings us to Morgan. She is a Registered Dental Assistant who primarily works at our front desk. Morgan lives in Ringold, Georgia. She has a beautiful cat and 2 wonderful dogs. As you can see the dogs are spoiled rotten! They spend most evenings on the coach hanging out with the family. Believe it or not her cat gets along wonderfully with the dogs. Who knew cats and dogs living together in harmony! There is hope for this world. Savannah or as we love to call her Savanner. It is an inside joke that you should ask her about next time you are in our dental office. 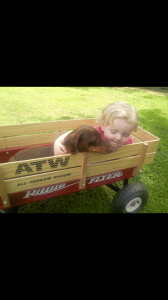 Savannah has two dogs, a wiener dog named Kiwi who got hijacked by her inlaws. Kiwi now lives with them so she got another dog piper. The most recent news about pets is Savannah’s daughter got a pony! Yes a real live pony her name is Bella! Every little girls dream! 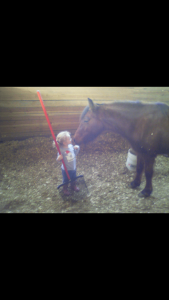 She loves Bella the pony and as you can see keep the stall very clean. She loves riding her pony and her pony loves her. 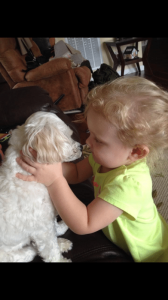 This is Savannah’s dog Piper and her daughter kissing the dog. So cute right? This Kiwi (remember the one her in-laws hijacked)! Kissing the horse. Can you see a theme here Savannar’s daughter love to kiss animals for sure. Whether you’re a cat person, a dog person, or anything in between, we’d love to hear about your pets too! Tell us why you love your pets in the comments below or share a photo with us on Facebook! Next time you come in for your dental appointment we would love to see pictures and hear about your pets! Pets are something we all love and can have a calming effect on us. There is proof that having pets can make you live longer.